Today’s average kindergarten student spends more hours in school than the very faithful churchgoer spends in Sunday school. A full-day kindergarten student spends approximately 1080 hours in school (with no time out for illness). IF your child attends Sunday school (9:30) AND worship (11:00) 52 Sundays every year from kindergarten through 12th grade, he/she will spend 1014 hours in Christian education. No wonder we struggle with teaching Biblical literacy! Clearly, church and family must work together to help our children develop the worship and Bible study skills that will nurture faith. 9:30 Sunday school and 11 a.m. worship workshop do not duplicate each other. We do tell the same story, but we explore it more deeply in different learning styles. At 9:30 we have more time to spend on music, Bible verses and the Bible computer lab. Our Sunday school explores some of the major Bible stories and faith concepts through child-friendly multimedia workshops. We use drama, puppets, cooking, a computer lab, games and puzzles, and whatever other media we can imagine to help us delve into one Bible story over a three-week period. Slowing down our storytelling in this way allows us to plumb the depths of each story and helps us find the Holy Spirit at work in our lives and our world. To complement the adult programs we’re offering June through August, we’re planning activities for all-age children from 9:30 to 10:45 every Sunday morning. Infants and preschoolers should go to the Nursery (in the Skewis Room). Older children should gather in Class Room A (next to the gym). Parents should collect their children from Class Room A at 10:45 to take them to worship. They will be invited to leave worship before the sermon to participate in their own Bible storytelling activities through the close of worship. At 9:30 a.m. all children 4-years-old through 6th grade gather in the Music Room (Classroom A next to the gym) where we share favorite Sunday school songs and at least one of the hymns for worship that morning. 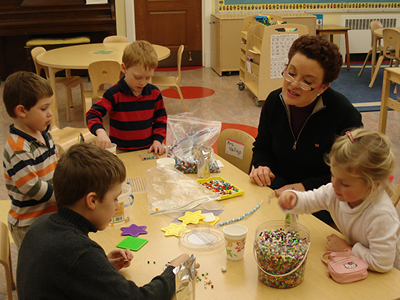 At 10 a.m. we dismiss the various age groups to their individual classes. We’ve recorded an audio tape of some of our favorite songs — please ask for a copy! Parents, please come to your children’s classrooms as close to 10:45 a.m. as possible. This allows both children and teachers time to get ready for worship. Children learn best how to worship by worshiping with the congregation. We recognize their shorter attention spans by providing an option for them to leave the sanctuary following the Children’s Portion, immediately prior to the sermon. On Sundays when we celebrate communion, the older children return to the sanctuary to participate in the sacrament with their parents. After leaving worship, children explore a different multimedia workshop based on the same story as their 9:30 experience. Far from being a reiteration of the earlier lesson, this “repetition” in a new medium forms a strong foundation for Bible literacy. Our workshops focus on the sermon text for the morning whenever possible. Each workshop unit will include a hymn which will be sung in worship.